Disney World golf courses are getting new Disney-themed refreshment carts for their golf courses according to Disney Parks Blog. 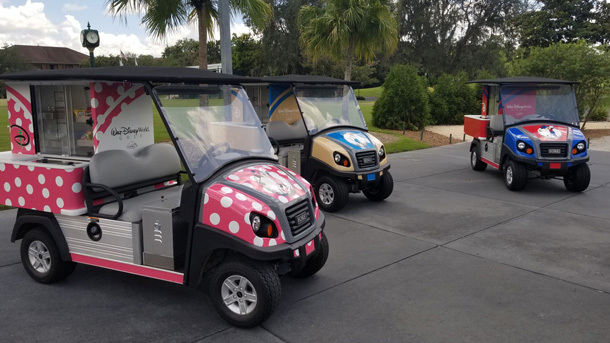 At our Palm, Magnolia, and Oak Trail courses, you’ll see refreshment carts with designs inspired by Mickey, Minnie and Goofy, and at the Lake Buena Vista course there’ll be a Mickey-inspired cart. The article doesn’t mention any new beverages or food offered from the new theme-inspired carts. Obviously, this is another easy marketing/branding play by Disney for minimal cost. As Disney hosts events they can use these carts in pictures, videos, etc. The character-themed refreshment carts are a result of Disney Golf’s ongoing efforts to continually explore fun ways to enhance the overall guest experience during play. Not exactly sure how this will enhance your golf game, but at least they will be easily recognizable when you need that next beer refreshment.